The owner of Cedar Grove Gardens, which has become one of Dorchester’s iconic businesses since it opened in 1979, sold the Adams Street property last week, but he intends to stay open in the same location across from Cedar Grove Cemetery. Richard O’Mara told the Reporter this week that he plans to keep his landmark store in operation for up to another six years through the terms of the sale, which allow him exclusive lease options for the site. The property has been sold to Adams Street LLC. The price of the transaction has not been disclosed. The 11,413 square-foot site at the corner of Milton Street was valued at $799,000 by the city in its most recent assessment for tax purposes. The 63-year-old O’Mara said that two back-to-back bouts of health scares— heart surgery in 2016, and cancer treatments last year— prompted him to think about a potential sale. His health has improved significantly in recent months, he said, but the timing was right to pull out some of the money from the property to retire debt and plan for the future. Part of the motivation to sell the property is driven by changes in the Boston flower industry, most notably the relocation last year of the Boston Flower Exchange to Chelsea from its longtime home in Boston’s South End. 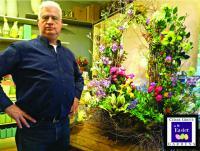 O’Mara is a longtime buyer at the flower exchange— and needed to settle some debt with the exchange’s owner. “I’ve had a wonderful relationship with Gerry Cupp for the last 37 years,” said O’Mara, who visits the exchange up to four times each week to stock up on flowers to sell in his store. Born and raised in Mattapan and an alumnus of Boston Latin School, O’Mara was initially drawn to a career in law or politics, but switched gears while a student at UMass Amherst. He took a job right out of college and learned to grow plants and flowers in the greenhouse inside Cedar Grove Cemetery. He always had a passion for gardening and landscaping — “to me it was never a chore taking care of my parents’ yard,” he says—and he dived into his new career with abandon, developing a small base of customers among neighbors and people who visited the cemetery to decorate graves. In 1979, the former president of the cemetery— Ted Amberman— encouraged the-then 24-year-old O’Mara to open his own florist shop. At Anderman’s urging— and with a $5,000 loan from his own dad— O’Mara bought 911 Adams Street, which had been used for close to 80 years to carve and sell headstones. Amberman, who was 80 years old and a mentor to O’Mara, sensed he might be getting “cold feet,” so he made a loan for another $5,000 to the younger man so that he could secure the property. When Amberman died in 1982, O’Mara, who still owed him the bulk of the $5,000 loan, launched a scholarship in Anderman’s name at their alma mater, Boston Latin. It remains in place to this day. The building — which was designed on giant granite slabs for the original headstone business—needed a complete restoration, which O’Mara undertook himself with his father and friends. He eventually moved into the house and lived there for a number of years without many comforts— like hot water. The business grew into full bloom in the 1980s as it assumed a burgeoning wedding and special events focus. As a sign that Cedar Grove intends to remain a fixture for years to come, O’Mara pointed out that the business plans to host its wedding show on Feb. 23-24. O’Mara has been a civic leader in Cedar Grove and Lower Mills for most of his life. He has been a key figure in the Lower Mills Merchants Association and still serves as vice-president of the Lower Mills Civic Association. He launched a fund to help make improvements to Dorchester Park and has chaired two successful gala events in the park to endow the fund. He remains the president of the Dorchester Park Association and is active in the Neponset River Watershed Association, which he credits as a driving force behind significant improvements to the nearby waterfront. He is something of an expert in city zoning rules, having served in key voluntary advisory roles in re-zoning efforts under Mayor Tom Menino. He is frequently called upon to serve on planning boards for projects in Lower Mills, in particular. O’Mara and his longtime partner, Robert Ferrini, own the house immediately next door on Milton Street. O’Mara says he will make sure that whatever eventually comes next at the current site of Cedar Grove Gardens is acceptable to the neighborhood. He notes, with authority, that the location is zoned for a couple of two-family houses. “I still have a voice as a direct abutter as to how this property will be used,” he said. Whether it could somehow stay in operation as a garden center is something that remains an open question. “If you’ve got the right person, you can do anything,” O’Mara said. “I’ve always maintained that it takes someone with vision and a strong work ethic to do it. He notes, with pride, how so many of his employees are friends who have worked alongside him for decades. Others returned to assist in running the store when he was sidelined by illness last year.